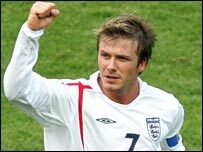 Former England captain Terry Butcher stands by his claims that David Beckham should have been dropped for the World Cup win against Ecuador. Beckham's single strike set up a quarter-final against Portugal. Butcher told BBC Sport: "He has rammed my words down my throat and I don't have a problem with that - but I stand by every word. "Wayne Rooney needs help up front. You have got to sacrifice a midfield player and, for me, that was Beckham." Butcher explained: "The only player who had not really performed to his capabilities before the Ecuador game was David Beckham." And the former Ipswich and Rangers defender revealed he was willing to discuss his criticism of Beckham face-to-face with the England captain, if he wished. Butcher said: "David has answered me with his goal. "I accept that and I have not got a problem with that and if I see him I don't know what he will do but I am fully prepared to talk it out with him. "We all like to see England win. No-one likes to receive criticism like that but that is my opinion and I will give it honestly. "If David has a problem he can come and see me. He knows what hotel room I am in." But Butcher - who labelled England's display against Ecuador as "shocking" - added that he now believes there is no way boss Sven-Goran Eriksson will leave out Beckham before his reign ends at the World Cup in Germany. He said: "It is completely immaterial what I think the formation will be because David Beckham will play in the next game. "Eriksson is never, ever going to drop Beckham. He said he would do but I don't think he ever will. "Beckham has contributed to quite a few goals recently but I look at the England team and I think it is strangulated. It is constricted. "There is no freedom, there is no expansion, there is no free-flowing football as you have seen from Mexico and Argentina and as you have seen from Germany. "And yet if you look at the players there is all that there."